Your property, your rules. Sounds good, right? News flash: bad tenants don’t care. If you’re sick of problematic tenants, here’s how to deal with them. Pulitzer Prize-winning journalist Matthew Desmond researched American evictions and found that an estimated four eviction filings occur in America every minute. It’s been noted that eviction is not only a condition of poverty, but also a cause of poverty as well, and not just for tenants. Landlords experiencing bad tenants or bad renters suffer financially as well. Find out how to deal with problem tenants and avoid becoming one of those statistics right here. There are a number of ways to avoid ever getting a bad tenant in the first place. From credit checks to prior eviction screenings, today’s landlord has more research options available to them than ever before. But savvy tenants today are finding a way to get into a house even with bad screening checks, or avoiding them all together. Many renters today are also operating under the assumption they have more rights than landlords. That simply isn’t the case. Normal wear and tear on your home is one thing, but when you have a bad tenant, wear and tear on your emotional state or finances is a whole other show. When it comes to landlord and tenant’s rights, both parties have rights. Bad tenants just won’t care when it comes to yours. But you’ll have to comply with theirs if you want to avoid financial or even criminal claims. The good news for landlords in Colorado is that they have more rights than many other states. An agency that ranks states on tenant rights found that there were only six states worse than Colorado when it came to tenant’s rights. The Colorado landlord that knows the law will have an easier time dealing with problem renters. In Colorado, for example, you only need to give three day’s notice for a lease violation or for nonpayment. Colorado landlords also have up to 60 days to return security deposits. You are permitted to enter your property at any time with no notice, and you can charge whatever you want for a security deposit. That is unless it is otherwise stipulated in the lease. Avoid bad tenants with an iron-clad lease that continues to protect your rights. Consult a lawyer that specializes in collections and landlord and tenant situations to help you protect yours. If you are dealing with problem tenants, document everything. A written notice is required for eviction, but you also want to document every single communication or piece of damage to your property. Start doing this before they become problem tenants. Use texting or emails instead of phone calls for communication, and take before and after pictures. Keep track of every payment, late or otherwise, and the steps you took to collect. Renting is a wonderful alternative to listing your home. But it can quickly become a costly and emotionally draining nightmare. A bad tenant is one thing, but a court case is another. You want to go into any possible court filing with evidence and the upper hand. It may sound obvious, but safety comes first when it comes to everything in life. But if you have bad tenants, you may not know exactly why they are bad tenants. You may not even know what you need to do in order to stay safe. They may own firearms you weren’t aware of, have their own “science labs” in progress in your home, or worse. And you don’t want to find out on your own what that “worse” could be. The Pueblo County Sheriff’s Office can help you with bad tenants, as can any local sheriff in America. But you can also just wipe your hands clean of bad tenants once you remove them. 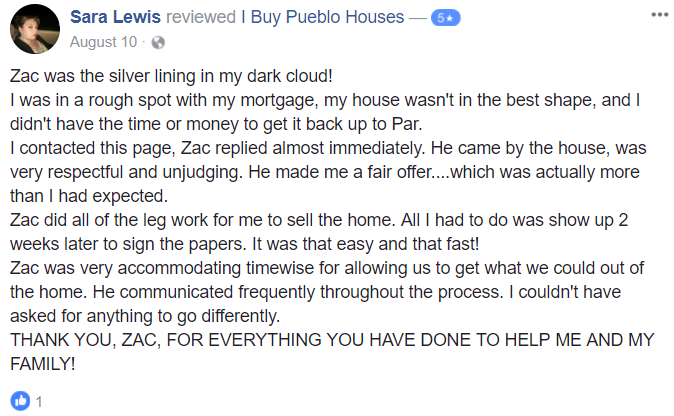 Discover how to get cash fast and sell your pueblo co home today without ever having to worry about landlord problems again.